Just imagine diving on a Phuket wreck 18 metres down, the water is warm and clear, a great day for diving. Although the wreck is too big to tour the entire length in a single dive when swimming, using a dive propulsion vehicle, you can cruise its length up the starboard and back along port, no problem at all. You even have time to stop periodically to check out the winch, peer inside the hold, take photos, and so on. Returning to the dive boat, you learn that another diver had dropped her prescription mask off the dive platform. Ouch! Not being able to see can take the fun out of a dive trip. After a reasonable surface interval, you sand your buddy can use your DPVs in a search pattern over the bottom behind the dive boat. Not only do you find the mask, but you also have enough air and bottom time remaining to cruise over to the wreck again - that never would have happened without DPVs. 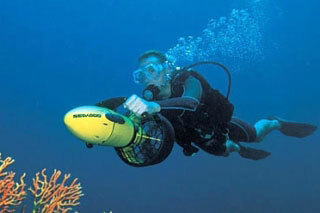 Your Phuket scuba diving DPV programme will include 2 open water dives, which may be conducted in 1 day. The first dive allows you to practice basic vehicle handling skills and the second dive prompts you to plan and execute a typical DPV dive.